Adding an unexpected gravity to kitsch, Irish artist Conor Walton’s still life paintings tap into the Old Master tradition of the vanitas to transform everyday objects, like toys and plastic shopping bags, into powerful (and playful) reminders of our mortality. 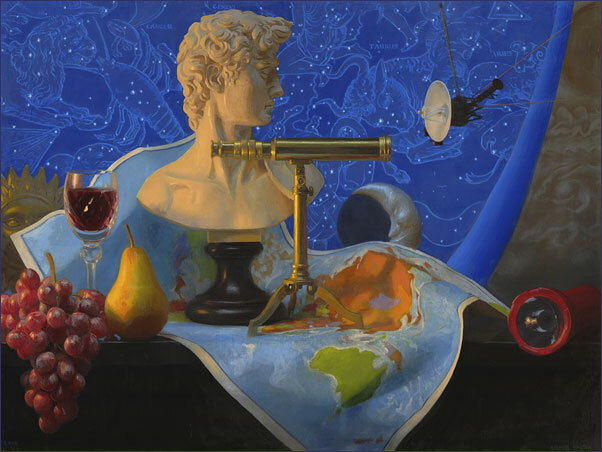 Invoking Renaissance cabinets of curiosities and studioli, while deploying painterly Old Master techniques, Walton’s oil-on-linen paintings add an element of facetious levity while tapping into traditions of still life and vanitas paintings. A selection of these paintings, all executed in the artist’s adept, realist style, are currently on view in “Conor Walton: The Enemies of Progress” at CK Contemporary in San Francisco. 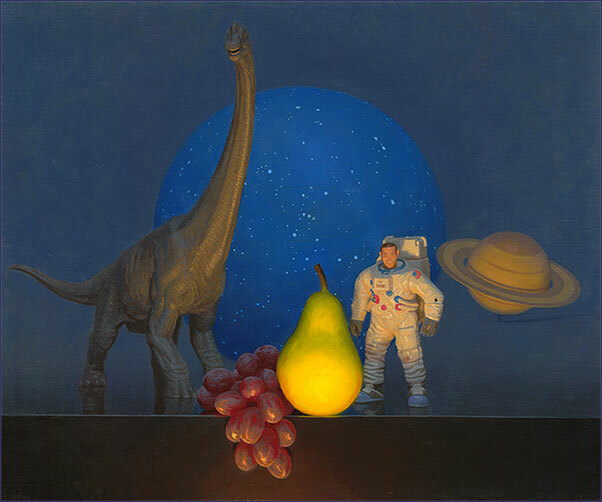 Several works include miniature models of modern space technology like satellites, astronauts, and lunar modules, cheekily set against an astrological tapestry, dinosaur figurines, or propped on a table with jumping frogs and a melting clock. Walton also plays with the use of memento mori (in Latin, “remember that you can die”), symbols that were included in paintings to serve as reminders of death, which were most often skulls. He, too, employs skulls in some works, but also carries the idea into paintings of moldy bread and an unwrapped bar of chocolate or a stick of butter, invoking ideas of decay and consumption. Walton seamlessly blends old and new, rendering Renaissance artifacts together with contemporary objects and settings. 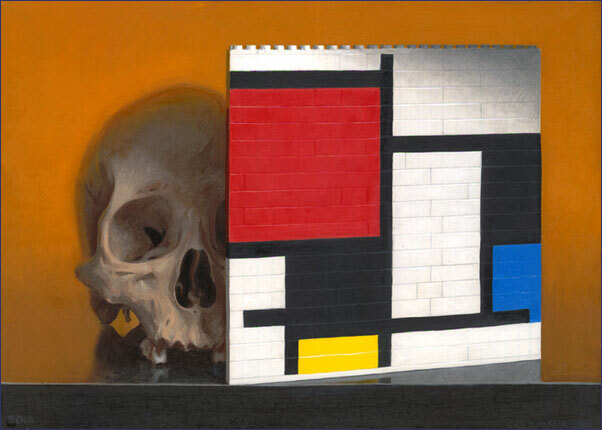 Lego Mondrian (2015), for example, shows a skull and a wall of Lego bricks arranged to resemble a Mondrian painting. His handling of paint and use of chiaroscuro harkens back to his Old Master predecessors, but feels decidedly fresh, capturing elusive contrasts like those between transparency and opaqueness. Walton’s visual vignettes seem to satirize the still life tradition even while paying it respect. Regardless, the reference to mortality perseveres. In his version of the vanitas, a garish toy dinosaur and a miniature soldier become commanding harbingers of the effects of globalization; a cluster of tiny Disney princesses and Marvel comic figurines serve as distress signals in the face of acts of terrorism; and a solitary plastic bag of oranges becomes an allusion to impending and inevitable environmental degeneration. It is in this fusion of the sobering and the playful that Walton’s still lifes induce a satisfying visual dissonance, not unlike a memento mori. “Conor Walton: The Enemies of Progress” is on view at CK Contemporary, San Francisco, Nov. 7 – Dec. 7, 2015.